OXFORD, Miss. 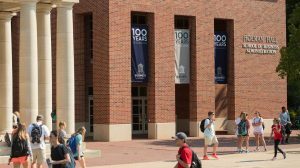 – The University of Mississippi’s online Master of Business Administration program has been named as one of the best in the nation by U.S. News & World Report. The rankings, released today (Jan. 9), place Ole Miss at No. 25 nationally. “We are thrilled to have this external recognition of the success of our online MBA program,” said Ken Cyree, dean of the School of Business Administration. “This achievement is a reflection of the dedicated faculty and staff who have created an excellent learning environment for our online MBA students who are not able leave their jobs in order to obtain their degrees. MBA programs have a greater enrollment than any other type of graduate business degree program in the country, the U.S. News release noted. Prospective students often narrow their research exclusively to programs that award MBAs. To aid their efforts, the publication compiles annual rankings of distance-education MBA programs. “A strength of our online program is that all of instructors are full-time faculty at Ole Miss,” said Walter Davis, faculty adviser for the MBA program. “The curriculum for the online program is the same as the campus program. For the 2018 edition, U.S. News ranked online MBA programs using five categories: student engagement, admission selectivity, peer reputation, faculty credentials and training, and student services and technology. The publication selects factors, known as ranking indicators, to assess each program in the five categories. A program’s score for each ranking indicator is calculated using data that the program reported to U.S. News in a statistical survey and from data collected in a separate peer-reputation survey. The strength of the Ole Miss curriculum is a plus for businesses in the state, said Ashley McGee, the program’s director. “Today’s professional is busy,” McGee said. “They are concerned with projects at work. They are caring for their children. They are involved in their communities. Our online degree is designed for them. It is flexible and entirely online. UM edged Oklahoma State, ranked No. 30, and ranked ahead of the University of Arizona, No. 33; Syracuse University, No. 42, and Louisiana State University, No. 51.